Work days to prepare for the spring prairie burn have been set. The rain held off but not the wind. We had a full field of 40 registered teams and something new this year as we asked some local non-profits to decorate some holes. They outdid themselves with some unique challenges. The fifth annual Extreme Bocce Ball Fundraiser of the Elkhart Morning Rotary club reached its' zenith. The day was filled with great weather, excellent participants and event sponsors, and of course, highly competitive (cough, cough) bocce ball. While winning was not the ultimate goal (really, it was a fund-raiser) we do want to acknowledge those who came out on top. First of all, the winners are our local high school senior scholarship recipients. 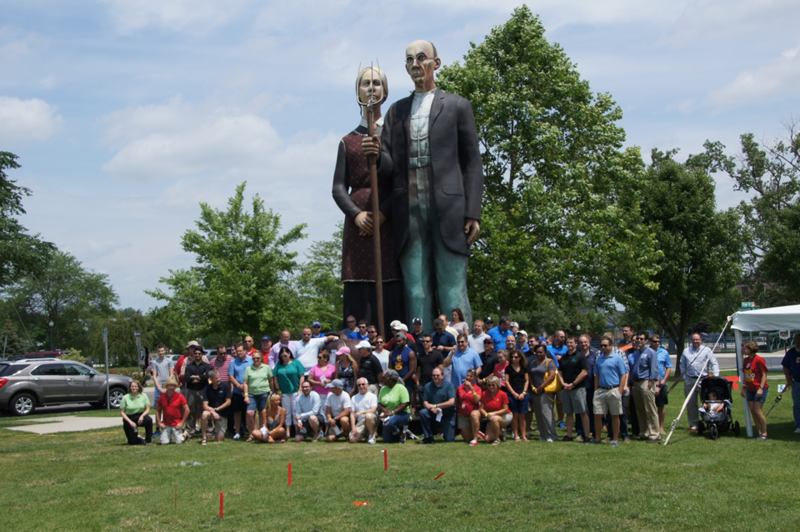 The overall winners of the tournament are noted to be Matt Wetzel and Jody Miller, representing Bradley Company. Congratulations, and a hearty 'thank you', to everyone who participated, our supportive sponsors, and all the volunteers who helped make this a very special day. The planning to make the 2017 event even bigger and better has already begun! The Elkhart Morning Rotary Club has been continuing with our commitment to service in the community with the recent completion of multiple work days at Elkhart's Woodlawn Nature Center. Additionally, EMR has constructed signage for the Woodlawn Nature Center to mark paths and other things of note at the Center. The Elkhart Morning Rotary Club is excited to announce we have awarded our annual Elkhart Central High School Scholarship to Tyler Piazza. Congratulations to Tyler! Elkhart Morning Rotary is proud to announce that member Burne Miller was recently awarded a Rotary Foundation award for lifetime service. District Governor Roger Sims was on hand at the May 19th club meeting to present the award to Burne for his many years of dedicated service to Rotary and his community. Members of the Elkhart Morning Rotary Club spent time this past Saturday morning supporting a wonderful cause and helping some very thirsty 5K runners stay hydrated! Local graduates of the Girls on the Run Program participated in a 5K at Potawatomi Park and EMR was on hand to cheer them on and work at a water station to aid them in their run. 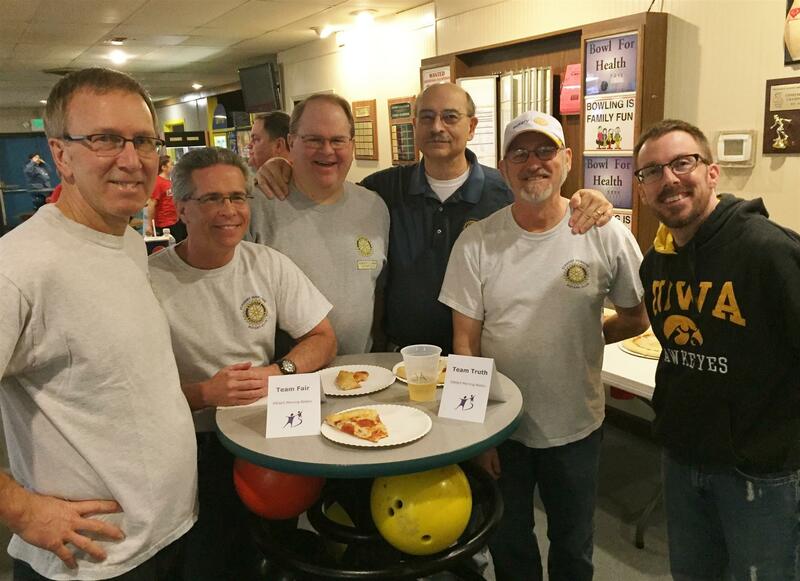 Members of the Elkhart Morning Rotary Club spent the afternoon of March 13th Bowling in the Big Brother Big Sisters Bowling For Kids Sake fundraising event at Country Club Lanes in Elkhart. The action was intense, and the scores competitive, but fun was had by all. Most importantly, however, was club members were able to raise hundreds of dollars in donations to this important cause. This is another great example of how the Elkhart Morning Rotary club is making a difference in the community and having tons of fun doing it! Elkhart Morning Rotary Ringing in the Holidays! Members of the Elkhart Morning Rotary Club recently pitched in to help raise money for the Salvation Army by participating in bell ringing at the Wal Mart on County Road 6. This annual tradition for the Morning Rotary Club is always a highly anticipated event and just another way the Elkhart Morning Rotary club gives back to the community! 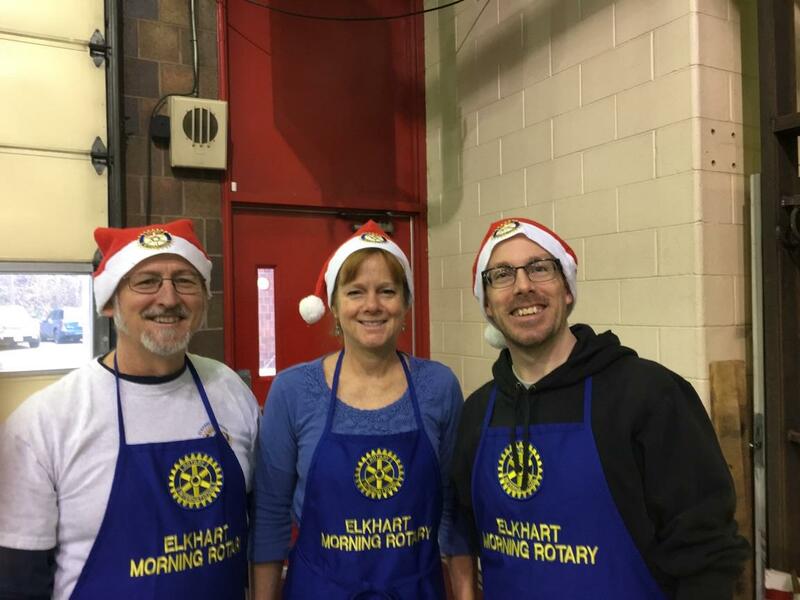 Elkhart Morning Rotary Helps at Breakfast with Santa! Members from the Elkhart Morning Rotary Club happily joined in to help serve hundreds of people a wonderful sausage and pancake breakfast at the Central Fire Station in Elkhart on the morning of Saturday December 5th. It was a wonderful event for all involved as revelers young and old left with full stomachs and spirits high! Please click the link for more photos! The Elkhart Morning Rotary Club spent the morning of Saturday, September 26th working at the Boot Lake Nature Preserve in Elkhart. Club members were joined by staff from the Elkhart County Parks Department in tasks such as brush clearing along the parking lot fence lines, clearing limbs and brush back from walking paths as well as repairing a roof vent on the shelter house. The weather was perfect and the work was good! 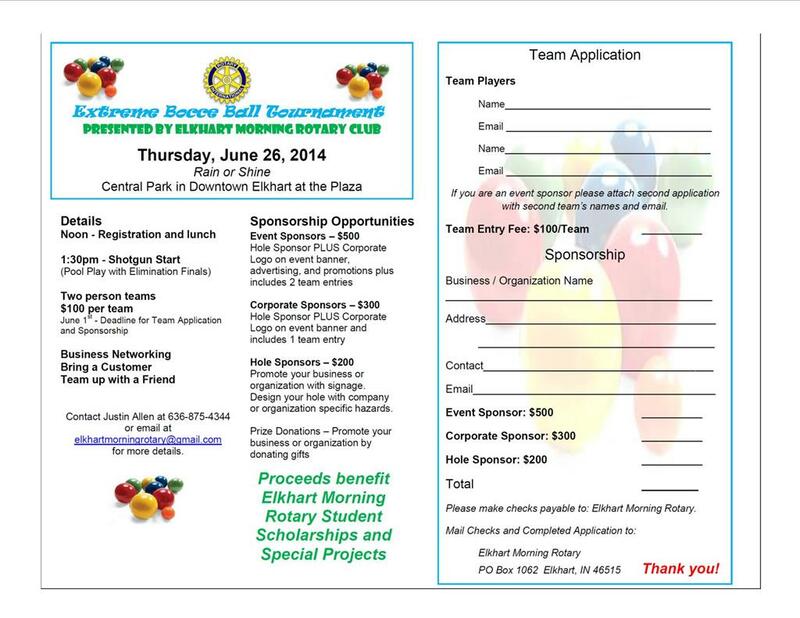 Please join us at a future Elkhart Morning Rotary Meeting to see the other important projects our club is involved in! The Elkhart Morning Rotary Club would like to thank all of the sponsors, participants, and volunteers who made our 4th Annual Extreme Bocce Ball Tournament on June 25th a success. Over $5,000 was raised for student scholarships and special projects, which in the past have included the Prairie Restoration Burn at Boot Lake Nature Preserve and grants to Girls on the Run and Reading for Life. Elkhart Morning Rotary Helps Girls on the Run! The Elkhart Morning Rotary Club would like to thank all of the sponsors, participants and volunteers who made our first Extreme Bocce Ball Tournament on June 28th a success. Roughly $3,500 was raised for student scholarships and special projects. Even with the extreme heat that day, everyone was smiling and having a good time. Thank you to the event sponsors: 95.7 The Fan, First State Bank, Pillars of Elkhart, Ancon Construction, Marbach Brady & Weaver, McDowell Enterprises and Elkhart Supply Co. Thank you to the corporate sponsors: NIBCO, KeyBank, Himco, Tom Naquin, Tiedemann Wines, Rose Brick, GRC Golf Products and Hill Excavating. Thank you to the hole sponsors: Elkhart Brass and The Troyer Group. We would also like to thank the city of Elkhart for allowing us to use Central Park, McCarthy’s for supplying lunch, Rodino Liquors for the adult beverages, Insight Accounting Group for the cold towels, Franklin for the brand new bocce ball sets and The Elkhart Truth for the publicity before and after the event. Discussions have already begun to make next year’s event even better. We hope that you will join us for another fun-filled opportunity to raise money for our community. If you would like more information on Elkhart Morning Rotary, please contact Kristi Bly at 312-0822 or outdoorkristi@gmail.com. If you would like to attend a meeting, guests are always welcome at 7 a.m. every Thursday at McCarthy’s on the Riverwalk, 333 NIBCO Parkway. ELKHART — The Elkhart Morning Rotary Club brought together 37 two-person teams to play Extreme Bocce Ball in Central Park for four hours on Thursday afternoon. The course was set up on Central Park with 20 goals. Two teams of two people competed against each other as they moved through the course similar to a miniature golf course. After three rounds, the tournament went into single elimination, round-robin style until one team won. While the Elkhart Morning Rotary supports other organizations in the community like Salvation Army and Child and Adult Protective Services, it gives two $1,000 scholarships for college each year to seniors from Central and Memorial high schools. Proceeds from the Extreme Bocce Ball Tournament support these scholarships. ELKHART — Central Park in downtown Elkhart will be transformed into a mini-golf-like course Thursday afternoon. But teams won’t be putting around the course; they’ll be competing with bocce balls. 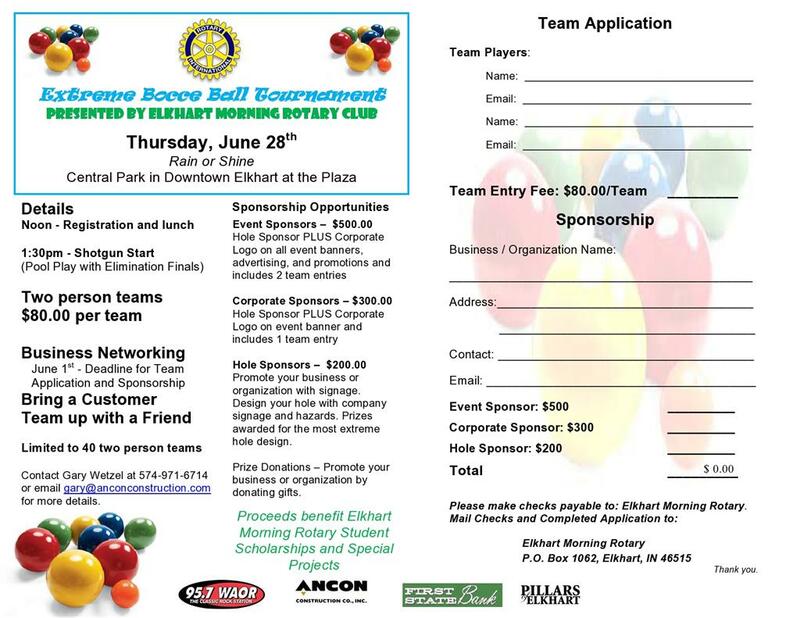 Extreme bocce ball is coming, thanks to the Elkhart Morning Rotary. The club is hosting its first extreme bocce ball tournament to benefit students at Elkhart Central and Elkhart Memorial high schools. Money raised will fund scholarships for students at the schools when they head to college. The Rotary will apply any extra money raised to projects with the Salvation Army and Child and Parent Services (CAPS). The event will begin at noon with registration and a lunch provided by McCarthy’s on the Riverwalk. Soda and water will also be available throughout the afternoon. Participation is open to the public. To submit a team contact Gary Wetzel at gary@anconconstruction.com. Elkhart Morning Rotary Club will be changing meeting locations on September 1, 2011. The new meeting location will be at McCarthy's on the Riverwalk, 333 Nibco Parkway, Suite A, Elkhart, IN, 46516. Register now for the 3rd Annual Extreme Bocce Ball Tournament! 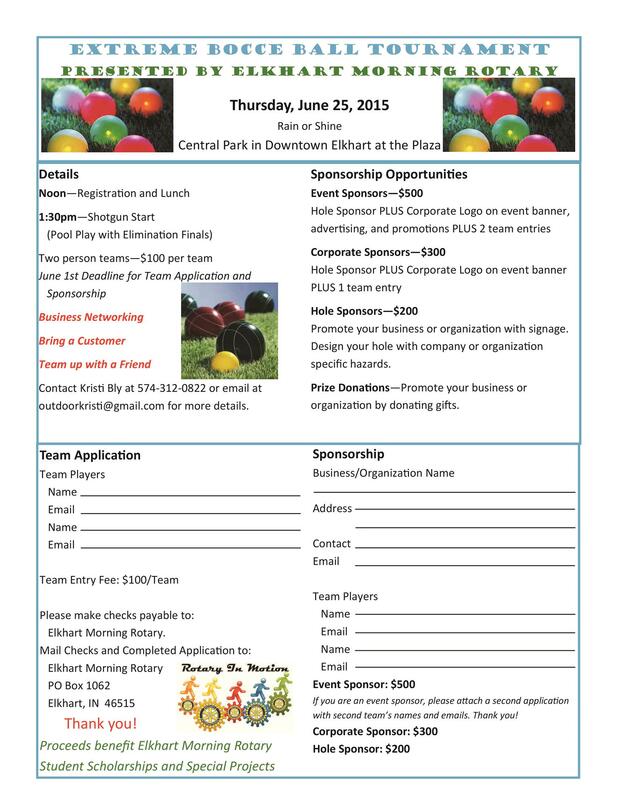 Proceeds from this fun event help benefit Elkhart Morning Rotary Student Scholarships and other special projects. Help make a difference and have a ton of fun at the same time! Download the application from the "Download" links on the right side of the webpage and sign up now! Group Study Exchange is Rotary's premier inter-cultural educational program for young professionals and an excellent way for Rotarians to build goodwill and better understanding among cultures leading to a more peaceful world. GSE exposes Rotary to non-Rotarian young professionals who often go on to join and serve Rotary during their lives. A number of Rotary leaders had their first exposure to Rotary through GSE. Program and international travel costs are paid by The Rotary Foundation. Our exchange partner district is responsible for all hosting of our team while in their district including internal transportation, all meals, all lodging, and activities. Clubs within our district will be providing similar arrangements for our visiting teams. Team members are young professionals between 25 and 40 years of age who live or work in our district. This once-in-a-lifetime opportunity experiences a unique cultural and vocational Rotary exchange. The Team will return with new perspectives and fresh ideas understandings of different cultures, commerce and governments, as well as rewarding skill-building opportunities and personal growth. Team Members & Club sponsors: Tara Burge – Fort Wayne; Rhonda Ladig-Moxter – Fort Wayne; Nathan Bosch – South Bend; and Kirk Weesner – Fort Wayne. Our visiting Inbound Team from Austria will arrive April 13th thru May 11th, 2013 and will have an opportunity to meet our outbound team at the District Conference in Merrillville, next April. Their individual bio’s are on the www.rotary6540.org website under Group Study Exchange. The HUB clubs hosting the Inbound team will arrive their first week to the Anthony Wayne Rotary, then South Bend Rotary, Crown Point Rotary and will finish with the Bluffton Rotary. Within their weeks at the HUB clubs they will have vocational visits, cultural experiences, fellowship opportunities and Rotarian involvement. The HUB clubs will coordinate with the Spoke clubs, transportation, host families, meals and numerous experiences. The Bluffton club will be hosting the farewell dinner for all to bid our friends from Austria farewell and best of luck. For more information on GSE, Inbound teams and Outbound teams please visit our website for up to date information. Our outbound team will be preparing a Blog to follow as well. For additional information contact Linda Popovich, GSE Chair.